At Kingdom Dominion Ministries, Int'l we believe in the importance of community! God calls us to a loving relationship with Him through corporate worship and private worship. 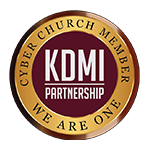 We have created KDMI Cyberchurch membership (KDMI CC) to accommodate those persons who consistently follow KDMI via social media or other internet mediums and are unable to attend our services. The establishment of KDMI CC not only affords you an opportunity to maintain a personal relationship with God, but it simultaneously gives us an opportunity to fulfill our call to evangelize the world for Jesus Christ! You will receive: 1) Personalized messages available to KDMI CC members via a secured link that will continue to build, encourage, inspire, and motivate you personally and spiritually; 2) Updates on all events, conferences, webinars, or workshops that will aid in your personal development; 3) Notification of Apostle White’s personal itinerary in the event you are in the area and would like to experience the ministry of Apostle White in-person; 4) Notifications and/or links for broadcast viewings available only to KDMI CC members; 5) Commitment in prayer for any prayer needs you may have, knowing that the Pastors will pray earnestly as it concerns you. What We Can Expect From You! There is no monthly fee to be a part of the KDMI CC. However, we believe that if the ministry is impactful and is a blessing to you or your household, you should sow seed accordingly. We also ask that you commit to pray for KDMI and the KDMI CC as happenings are made known to you via email, website and social media updates. We ask that you visit: www.kdmimin.org and familiarize yourself with the ministry. Finally, if you desire to give your tithes and offerings, please visit the website and select the “Give Now” link. Simply complete the Cyberchurch Membership Form below. That’s it! We are excited about connecting with you! Together we can make a difference for the kingdom!